“Am I in Memphis? It doesn’t smell, doesn’t sound, doesn’t look like Memphis,” I wondered, this Friday, as I visited galleries and shops along Broad Avenue for the 4th annual Broad Avenue Arts District Art Walk. I discovered there are a lot of people who live there, work there on Broad. What a cool gig. There was a comic book art show. You know I love the cartoons. 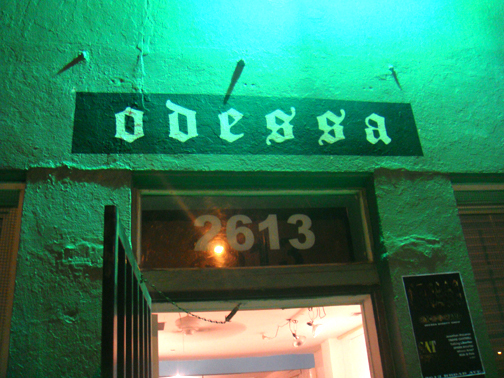 I checked out Odessa, finally. I’m definitely going back and staying longer. When I walked inside I was pleasantly greeted by some beautiful work done by artist Brooke Kanther, she’s a student at MCA. I liked the organic, serpentine, look-and-feel of her artwork. After visiting a few more galleries, I wriggled my way into this crowded room that wasn’t quite a library, wasn’t quite someone’s apartment, and wasn’t quite an exhibit space. And it smelled like old books, which I curiously liked. It’s so refreshing to see the Arts progressing and being supported here. Could we do more? Abso-freaking-lutely. I see the creative class in Memphis is expanding, and I want to be apart of or support it in any way I can. Memphis will, as a result, become a more diverse and less polarized place to live. The kind of city, I could hang out with, show-off to my friends – a trophy city. The kind of city, that would make my ex-boyfriend jealous. The kind of city, I could whoop-and-holler for during its graduation ceremony. The kind of city, I could cut the crust off of its bread, because I loved it so much. Next year’s Art Walk, you should come with me. I have pictures and a small video clip. See. Enter your email address to subscribe to this blog and receive notifications of new wallpapers, interviews, street art and more by email.